Fruit Tree Projects are helping feed communities all over the world. Here’s how the Santa Cruz fruit tree project got started. By Maria Grusauskas, from Shareable. Over the past few years, “Fruit Tree Projects” have been popping up all over the world, from Vancouver and Portland, to New Orleans, to Fiji and Australia and beyond. They start small, with just one or two proactive individuals who are pained by the sight of perfectly good fruit in the late stages of decomposition. Some Fruit Tree Projects redistribute their fruit harvests to undernourished communities, while others gobble them up themselves, and many celebrate the harvest by getting together and processing large quantities of fruit into any number of delicacies. 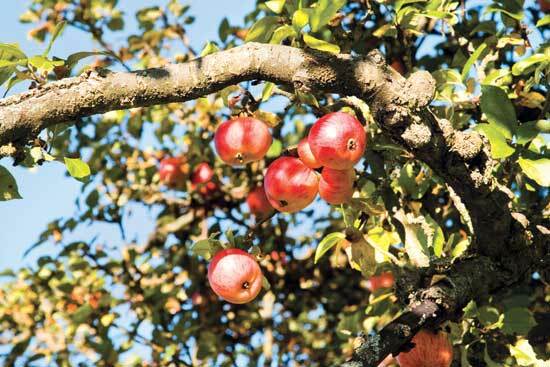 For Steve Schnaar, (whose childhood memories include picking apples with his family), knocking on doors to inquire about overladen fruit trees was a hobby that soon blossomed into the Santa Cruz Fruit Tree Project, now in its third year in Santa Cruz, California. “I have a long history of knocking on people’s doors and saying ‘it looks like you have more apples than you can handle,’ or cherries, or whatever it may be, and it’s usually true—most people with a big tree aren’t using it all, or are happy to share,” says Schnaar. The success rate is surprisingly high, especially because most people—especially if they live alone—can’t eat all of the fruit produced by a single tree, and Schnaar estimates about nine out of 10 people say yes to sharing their excess. Do-it-yourself fruit processing is at the heart of The Santa Cruz Fruit Tree Project, and the community that’s been growing out of it. Most harvests are followed by a gathering that teaches how to preserve the fruit they harvest—from drying persimmons using the traditional Japanese method Hoshigaki, to fermenting the fruit into wine with local DIY winemakers. They’ve also hosted apple cider pressing parties (with a bike-powered press, of course), made vinegar and countless preserves, from marmalades to chutneys. And when there’s still too much fruit to go around, or the fruit is a little bit too mushy to give away, the chef of local restaurant India Joze often finds a culinary use for it. The post-harvest events bring together growers, community members, and local food experts, and they’re a birthplace for lasting relationships and useful skills promoting a sustainable culture. Schnaar’s project would have fizzled out had it not been for his devotion to it, and the whole-hearted embrace it has received from the community. Most of the fruit hosts have welcomed him and his fruit harvesters back each year, and the word is spreading. Harvests that used to see only a handful of people are now numbering dozens to even 40 or 50 people. Read this article in its entirety, including an interview with Steve Schnaar at Shareable.